As the gluteal muscles and the abdomen, leg muscles is influenced by hormonal variations. Behind the knees and thighs are the areas most prone to cellulite. Legs are affected by vascular dilation – varicose veins – a result of circulatory problems, deep or superficial, and the tendency of water retention. When this is added dry skin, especially after 35 years, problems with joint disease, joint located in either the femur or knee or ankle. All these have negative effects on the aesthetic plane, plus most of the times the sensation of pain. Completely ritual every night, you do for the skin, should be applied to your feet. * A cold shower: sit with legs extended in an oblique position in jet shower, with water temperature ranging between 20 and 22 degrees strictly Celsius, no more no less. * Apply an anti-cellulite cream, the whole foot, not only in areas affected by the “orange peel”. In areas unaffected cream prevents the surplus active substance is beneficial for “sick” areas. Add a moisturizer, especially in dry areas. 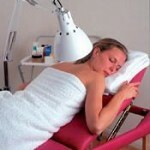 * Massage is ideal only if constantly repeated every evening. You can use a cream to take effect on vascular walls, in order to prevent varicose veins (or to mitigate). Massage with your fingertips, from ankle and hip in long or circular movements but always from the bottom up! Take your feet to professional! * Preso-massage, done by professional, lymphatic drainage is a technique which brings relief to your feet. It is effective in fighting cellulite. * Never stay seated for a long time. Ideally, every hour of sitting and moving to go ten minutes. It’s hard, but you can! * Go barefoot as often as you can. If possible, grass or sand.